"Wick? Wick? What a funny name! Isn’t a wick a part of a candle?" Bonnie laughed, as they landed on the sign just outside the town. "Wick is really ‘vik’, which is an old Viking word meaning ‘bay’. Look at the place. It’s got a magnificent bay, doesn’t it? The Vikings settled here long ago. There was a lot of fish for them," Bruce said. "Here we go again. Another history lesson, Bruce? Why don’t we just fly into town and see if we can find some flowers. I’m rather peckish," Bonnie said, rubbing her tummy. Bruce shook his head and the butterflies fluttered into town. "There’s a green spot with a few flowers down by the sea. There’s a man sitting on a bench. Look behind him. I see daisies," he said. The auld man sat still, looking out to sea. He pulled his tattered coat around him as the breeze blew in from the sea. "His shoes are worn out," Bonnie noticed. "One of them has a hole in it." "Shhh, Bonnie. That’s not nice. I like his shoes. They are good quality. He must not want to part with them," Bruce said. 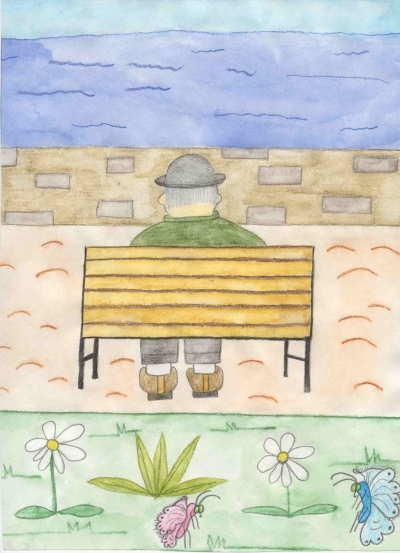 As they sipped nectar from the snowy white daisies, another man came and sat down on the bench. The two men began to talk of the old days in Wick. "Things aren’t like they used to be, are they, Gavin?" the auld man said. "Och, no. I remember the fishing boom. The harbor was full of boats, every color you can imagine. What a sight it was when they came in, with their nets filled with herring. Seagulls flew all around, squawking and hoping for a fish to slip into the water," Gavin answered. "Bruce, did you hear that? Seagulls are here!" Bonnie said. "He said in the old days there were seagulls. I’m sure there aren’t as many now," Bruce replied. "Remember the days when the town was filled with shops; not the kind like today, but shoemakers, like you were. Do you miss the auld days, Hamish?" Gavin asked. "Och, aye. There were five of us in town. We made the finest shoes. My hands worked with the leather. I can’t bear to part with the ones I’m wearing now. They bring back memories for me; the last reminder of my past. Och, for the good auld days, Gavin. I miss them. Now, I spend my time sitting here, watching the pelicans fly by, or an occasional fisherman standing at the wall. If I’m lucky, a few bairns will run by, laughing and playing," Hamish sighed. "Did you hear that? He’s lonely," Bonnie said, sadly. "We’ll be seeing you then, Hamish," Gavin said and walked away, leaving Hamish alone on the bench. Bonnie fluttered away from the daisy and landed on the bench next to Hamish. "What have we here?" Hamish said. "A wee butterfly. Och, you’re a bonny color of pink." He put his finger near Bonnie and she climbed onto it. Hamish smiled as he lifted her in front of his face. "Look at you." Bonnie looked into the man’s soft blue eyes. They were filled with kindness but looked sad and worn. Bruce, not wanting to be left out, fluttered up and landed next to Bonnie. "What’s this? Two of you? One pink, one blue. Och, what a grand day!" A finger reached up and softly caressed the butterfly’s wings. "Do you two want to sit wi’ me for a while?" Hamish asked. He lay his tired hand down on his lap. The butterflies stayed and listened as Hamish pointed out different places in town and told them the history and events that had taken place. He showed them places where terrible storms had washed buildings and people into the North Sea and boasted how on bright, sunny days, the sky was bluer than you could ever imagine. As sunset arrived, Hamish stood up. "I’ve got to go home now. Maybe you can come another time and sit wi’ me," he said. He raised his hand and shook it gently and walked slowly, his feet in the worn leather shoes, shuffling against the stones on the road. The two butterflies fluttered away. They landed on the sea wall and watched silently until Hamish was gone. "I’m glad we were able to keep him company for a while," Bruce said, feeling happy. "Me too," Bonnie smiled. "I think I’d like to have you show me about this town, Wick. The people here are grand, so the rest of the place must be too." They flew over to Noss Head. "Look over there," Bruce pointed out. "There are the ruins of Sinclair Castle. My friend, down south, told me that his grandfather used to flutter about the castle in his youth. That other castle is Girnigoe Castle. Somewhere there’s a Wick Castle too. All are in ruins now. I’m sure Hamish could tell you some stories about them." "Night’s falling quickly, Bruce. We’d better go now. Thanks for showing me around Wick. I hope we can come back again and stay with Hamish," Bonnie said. The two butterflies fluttered away, heading for a safe place to spend the night, knowing they’d never forget their day in Wick.